Fit ‘N’ Furry Pet Resort in Petaluma, CA is looking for pet lovers with a keen interest and skills in serving pets. We are looking for candidates with skills and experience for the following positions. Salary and benefits commensurate with experience and will be discussed during the interview process. Please submit the application form below with your resume and employment inquiry regarding any of the positions below. 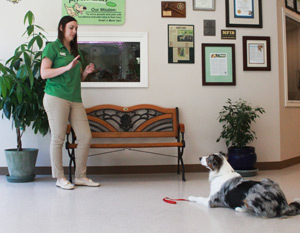 This position includes direct client interactions checking in and out pet guests. If you are a people and dog person who truly enjoys interacting with both, you'll love this job. Responsibilities include collecting new client information, booking reservations and positively promoting the many specialty care services we offer. Strong people and pet interaction skills, excellent phone skills and computer skills required. This position involves selling our pet care services to the public. Responsibilities include collecting new client information, booking reservations and positively promoting the many specialty care services we offer. Excellent computer and phone skills required. This position involves bathing, drying and brushing dogs receiving grooming services. You must be comfortable handling all types of dogs. Some grooming experience is required. This position offers tremendous opportunity for growth and learning skills in the pet care industry. This position involves caring for the guests that are lodging with us. Duties include cleaning, feeding and keeping the guests healthy and happy. Strong pet interaction skills and love for pets is required. Daytime and evening shifts required for this position. This position is ideal for true pet lovers. Responsibilities include playing with groups of guests and for quality one-on-one playtime sessions with the pet guests. You must have strong pet interaction skills and the ability to generate a fun environment for pets.